This May 2012 article in MIT's Technology Review discusses programmable nanoparticles that have shown promise in early cancer trials and may finally fulfill the promise of nanomedicine. This April 2012 article in MIT News discusses tiny particles could manufacture cancer drugs at tumor sites. A nanometer (nm) is one billionth of a meter, which is approximately one 25-millionths of a millionth of an inch. To help us gain a perspective on how small this really is, a red blood cell is about 5,000 nm in diameter. So, a nanometer is an incredibly small unit of length. In this article I will define "nanotechnology" as the design, development, implementation, testing and use of materials, devices, and systems through manipulation and control of matter on a nanometer scale, i.e., from 1 nm to 100 nm in size. Your body is made up of an estimated 100,000 billion cells and they range from 1,000 nm to 10,000 nm in diameter. Organelles (any of the many structures with specialized functions suspended in the cytoplasm within a cell) can be as small as 5 nm in diameter. Nanoscale objects smaller than 50 nm in size can easily enter your cells. Are researchers making objects so small they could selectively enter human cells? Yes, they are. Researchers are investigating the possibility of launching an armada of millions of ultra-tiny nanodevices into a patient's body for a range of purposes such as detecting cancer in its earliest stages, finding where cancer is located within the body by enhancing the way we image it, targeting anticancer agents specifically at malignant cells while minimizing their impact on healthy cells, and determining if these agents are actually killing cancer cells. Nanotechnology holds the promise of fundamentally changing the way in which cancer is diagnosed, treated, and prevented. For today's cancer patients, it is only a promise and it is not known if and when it might be realized but some early results are very interesting. Could nanomachines be tomorrow's doctors? Most of these early cancer-related nanotechnology R&D efforts are based on laboratory experiments and not on actual clinical trials with patients. However, some of the initial results are very encouraging and might portend the future. This article explores a few of these projects. This article deals, in part, with cells, genes, proteins, and chromosomes. Some readers may find it useful to review these biological entities. There is an excellent publication discussing many of them provided by the National Institute of General Medical Sciences (NIGMS) website. It is a large PDF document called "Inside the Cell." The National Human Genome Research Institute's "Talking Glossary of Genetic Terms" might also be useful. The article "Novel gene-silencing nanoparticles shown to inhibit Ewing's sarcoma" summarizes work done [Hu 2005 and Hu-Lieskovan 2005] in a collaborative study between the laboratories of Dr. Timothy Triche at Children's Hospital of Los Angeles and Prof. Mark Davis at the California Institute of Technology (Caltech). Gene-silencing is the targeting of a specific gene to prevent its expression (the process by which a gene's information is converted from DNA into RNA in preparation for translation into protein). The Triche and Davis teams developed a drug delivery system that consists of nanoparticles that transport gene silencing RNA into cancer cells and, once they are inside, they release the gene-silencing agent that inhibits part of the cellular machinery causing the cancerous cells to stop multiplying and die. Here's a more detailed look at how this works. The researchers attach a protein (transferrin) that normally delivers iron to cells so that it delivers short interfering RNA (siRNA) molecules to cancer cells. The main function of RNA is protein synthesis within a cell. siRNA molecules are a class of RNA molecules that interfere with the expression of particular genes. The researchers encased the siRNA payload with sugar-containing polymers to create nanosized particles. Attaching transferrin molecules to the outer surface of a nanoparticle is one of the methods used to target nanoparticles to cancer cells. The nanoparticles will seek out cancer cells that overexpress the transferrin receptor. A receptor is a protein on the cell membrane (or within the cytoplasm or cell nucleus) that binds to a specific molecule, a ligand, and initiates the response of the cell to the ligand. Nanoscale polymer/therapeutic "capsules" (nanocapsules) are typically designed to break down and release drugs at controlled rates in a specific environment, such as an acid. Research is now focused on creating novel polymers and exploring specific drug-polymer combinations. Some nanocapsules are synthesized directly from monomers while others are synthesized by nanodeposition of pre-formed polymers. A monomer is a small molecule that can become bonded to other monomers to form a polymer. Nanocapsules have also been formulated from liposomes and albumin. A discussion of liposomes appears in a later sidebar. The gene-silencing siRNA nanoparticles are injected into the bloodstream and pass through blood vessels into the surrounding tissue. When the siRNA nanoparticles enter the tumor cells, acidic substances cause the nanoparticles to release the siRNA. The siRNA shuts down (silences) particular genes by leading to the degradation of the RNA transcripts of these genes throwing a monkey wrench into the cellular machinery and halting the multiplication of cancerous cells. To test their approach they tried it on laboratory mice with Ewing's sarcoma tumors. They designed the siRNA to target a specific growth-promoting gene that is only active in Ewing's sarcoma tumors, the EWS-FLI1 gene. Their siRNA inhibits expression of EWS-FLI1, this shuts down part of the cellular machinery in the cancerous Ewing's sarcoma cells so they should stop multiplying. This treatment technique should have fewer side-effects than traditionally administered chemotherapy (which affects all dividing cells in the body, both healthy and cancerous) since the nanoparticles are doubly targeted to the cells that overexpress the transferrin receptor and have the EWS-FLI1 gene—i.e., the tumor cells. The ingested siRNA nanoparticles only exert their effect in cells that contain the EWS-FLI1 gene—i.e., they have no effect when taken in by normal cells. After three consecutive days of treating 50 mice, they observed, "strong, but transient, inhibition of tumor growth. However, when used over longer durations (twice-weekly injections up to four weeks), the results were striking. Long-term treatments with this delivery system markedly inhibited tumor growth, with little or no tumor growth in many animals." The article "MIT engineers an anti-cancer smart bomb" summarizes work done [Sengupta 2005] as a collaborative effort by researchers in the Massachusetts Institute of Technology (MIT) Biological Engineering Division, Department of Chemistry, and Whitehead Institute for Biomedical Research. The research team, led by Prof. Ram Sasisekharan, developed a drug delivery system that uses dual chamber nanocells to kill cancer cells. Given the complex dual chamber structure of nanoparticles, they call them nanocells. They use two anti-cancer agents, one in each chamber, that are sequentially released within cancer cells. Just as the Triche and Davis teams did, they coated their nanoparticles with a molecular tag that binds to cancer cell receptors. Once inside the cancer cells, the outer membrane of the nanocell dissolves and releases an anti-angiogenic agent from the outer chamber that collapses the blood vessels feeding the tumor and traps the nanocell within the cancerous cell. The nanoparticles then release a chemotherapeutic agent, from the inner chamber, slowly over time, killing the cancer cell. The researchers tested the two chamber nanocell in mice having either B16/F20 melanomas or Lewis lung carcinoma. They used combretastatin-A4 as the anti-angiogenesis drug and doxorubicin as the chemotherapeutic agent. They noted that the combretastatin caused a rapid vascular shutdown inside a tumor by disrupting the cytoskeletal structures. The cytoskeleton forms the inner structure, or backbone, of a cell and consists of microtubules and various filaments that spread out through the cytoplasm. They also noted that doxorubicin induced apoptosis (cell death) by intercalating with the DNA. The researchers fabricated the nanoparticles using the biodegradable and non-bioactive copolymer, PLGA. They bind (conjugate) the doxorubicin to the PLGA to achieve a slow release profile that is distinct from the characteristic 'burst' release associated with many nanoparticles. There are more detailed results in the paper, but I'll summarize here by stating that untreated mice died within 20 days, but 80% percent of the mice treated with the nanocell survived beyond 65 days. The nanocell worked better against melanoma than lung cancer, indicating the need to modify the design for different cancers. Their approach allows them to systematically evaluate drug combinations and loading mechanisms. The drug delivery technique used by the Triche and Davis teams and the MIT researchers to get the nanoparticles into the cancer cells is often called a "Trojan Horse" scheme because the nanoparticles are taken in by the cancer cells unaware of the danger involved in doing so. Although both use this approach to deliver the nanoparticles to the cancer cells, they use quite different approaches to kill the cancer cells once inside. Another approach to kill cancer cells is described in the article "Tumor-targeting Nanogels: The Search for a Kinder, Gentler Chemotherapy" which overviews work done by Nayak et al [Nayak 2004] at Georgia Institute of Technology (Georgia Tech) and Purdue University. The Georgia Tech team used a folate targeting Trojan Horse to deliver their nanoparticles (fluorescent, thermo-responsive microgels) to the cancer cells. The researchers used laser scanning confocal imaging to show that once inside the cancer cells the nanoparticles were deposited in endosomes and in the cyotosol. They then raised the temperature of the nanoparticles by an external means which caused the nanoparticles to shrink and clump together. Clinically, heating could be accomplished by focused ultrasound and the shrinkage of the nanoparticles could enable the release of an anti-cancer agent to kill the cell. There are three brief videos about this approach on the Georgia Tech website. As in the Triche and Davis work and the MIT research, the cancerous cells are targeted in this technique unlike traditional chemotherapy which is nonspecific in nature and works on any (rapidly) dividing cell. The molecule that is released could be a drug for that disease. Example Diagnosis and Therapy Computations for Prostate Cancer from [Benenson 2004]: "For example, the diagnostic rule for prostate cancer states that if the genes PPAP2B and GSTP1 are underexpressed and the genes PIM1 and hepsin (HPN) are overexpressed then administer the ssDNA molecule GTTGGTATTGGACATG, which inhibits the synthesis of the protein MDM2 by binding to its mRNA." Their computer has a computation module, an input module, and an output module. The computation module is a molecular automaton. An automaton is a finite state machine (FSM), that is, a machine that can be in one of a finite number of states at any given time. An FSM samples its input and decides which state to assume based on a transition function and its current state. The transition function tells the FSM which state to transition to based on its current state and its current input. The FSM reads its input and a transition occurs, it reads the next input and a transition occurs, and this process continues until there are no more inputs. When this occurs, we say the automaton has stopped. Depending on the state in which it stops, we say that it either accepts or rejects the series of inputs it has just processed. If the FSM stops in an "accept state", then the automaton accepts the series of inputs. If, it stops in a "non-accept" state, the series of inputs is rejected. A molecular automaton is an automation made up of biological molecules. The input module processes biological molecules as input data and the output module produces biological molecules as outputs. The input module senses messenger RNA (mRNA) molecules. mRNA is RNA that helps create proteins from DNA. When the computer senses one of these mRNAs it releases. The output module is capable of controlled release of an anticancer drug, also made of DNA, which inhibits expression of the tumor-related gene. In their initial computer design, any sufficiently long RNA molecule can function as a molecular indicator and any short single stranded DNA (ssDNA) molecule, up to at least 21 nucleotides, can be output. As a proof of principle of their concepts, they programmed the computer to identify and analyze mRNA molecules of disease-related genes18–22 associated with models of small-cell lung cancer and prostate cancer, and to produce an ssDNA molecule modeled after an anticancer drug. The researchers conclude that, "Our work demonstrates a robust and flexible molecular computer capable of logical analysis of mRNA disease indicators in vitro and the controlled administration of biologically active ssDNA molecules, including drugs." They also note that, "This approach might be applied in vivo to biochemical sensing, genetic engineering and even medical diagnosis and treatment." An in vivo study is one which takes places within a living biological organism. An in vitro study is carried out in isolation from a living organism, e.g., in a test tube. In vivo literally means "in the living" and in vitro literally means "in glass." So far, their molecular computer only works in the confines of a finely balanced salt solution. There are some significant hurdles to overcome before it can be used in a patient setting, e.g., the molecular computers should not provoke an immune response within the human body, they must be safe to use, the cancer model needs to be enhanced, the input module needs to recognize more than mRNAs, the output module needs to produce and output a wide variety of drugs, not just DNA therapies, and the computers would need to be tested in cell suspensions, tissue cultures, simple organisms, mammals and finally humans. The article "Nanotech-laser kills cancer, preserves healthy cells" summarizes work done [Kam 2005] in the Department of Chemistry and Laboratory for Advanced Materials, and the Department of Applied Physics at Stanford University. Their approach is based on the observation that biological systems are known to be highly transparent to 700- to 1,100-nm near-infrared (NIR) light. They exploit a property of a particular type of nanotube called single-walled carbon nanotube (SWNT). Carbon nanotubes are cylindrical carbon molecules. They exhibit unusual strength and unique electrical properties, and are efficient conductors of heat. SWNTs have strong optical absorbance in the NIR spectral window and the Stanford researchers used this property to optically stimulate nanotubes inside living cells—when the electrons in the nanotube become excited they begin releasing excess energy in the form of heat. In test tube (in vitro) experiments, the Stanford team found that when nanotubes were placed inside cells and radiated by the laser beam, the cells were quickly destroyed by the heat. However, cells without nanotubes showed no effects when placed under near-infrared light. They used the folate tracking Trojan Horse approach, discussed previously, to deliver the nanotubes to the cancer cells. Most of the nanotubes ended up inside cancer cells, bypassing normal cells. When the nanotubes were inside the cells and the researchers shined the near-infrared laser on them, the cancerous cells heated up and died. Prof. Hongie Dai and Dr, Dean Felsher, a lymphoma researcher in the Stanford School of Medicine, have begun a collaboration using laboratory mice with lymphoma in an effort to determine if shining near-infrared light on the animal's skin will destroy lymphatic tumors containing the nanotubes, while leaving normal cells intact. It they are successful this provides an extremely simple weapon in the arsenal of anticancer weapons; it simply used an intrinsic property of the nanotubes to kill the cancer. The article "Nanoparticles Transport Cancer-Killing Drug into Tumor Cells" summarizes work done [Kukowska-Latallo 2005] at the University of Michigan [UM] Center for Biologic Nanotechnology and the Department of Radiation Oncology, University of Michigan Health System. This team developed techniques to create dendrimers, (nanoscale polymers having a regular, branched structure), which are capable of carrying a number of molecules to specific places in the body. The dendrimers form compact nanoparticles of well-defined size, ranging from less than 2 nm to greater than 13 nm in diameter. The specific dendrimer nanoparticles developed by the research team have reactive chemical groups on their surfaces that can be used to attach targeting molecules, therapeutic agents, and imaging agents, either alone or in combination. 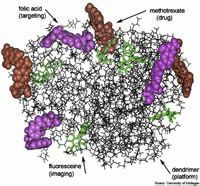 In the reported research, a dendrimer, having a diameter of approximately 5 nm and room to attach as many as 110 targeting, therapeutic and imaging molecules was used. The researchers used folate targeting to target the cancer cells. They attached methotrexate, which is an effective but highly toxic anticancer drug, to the dendrimer and also attached a fluorescent molecule to it to act as an optical imaging agent. Adding the fluorescent probe enabled the investigators to track the dendrimer's distribution in the body by measuring fluorescence in various tissues. These confocal microscopy studies confirmed that the targeted dendrimer nanoparticles were taken up by tumor cells. In addition, the nanoparticle delivered methotrexate was 10 times more effective than methotrexate alone at delaying tumor growth when tested in laboratory mice that had received injections of human epithelial cancer cells. Nanoparticle treatment also proved to be far less toxic to mice than the anticancer drug alone and the nanoparticles did not appear to generate an immune response in mice in the study. The microscopy studies also revealed that the kidneys quickly filtered any nanoparticles that remained in circulation and eliminated them in urine. The researchers found no evidence that nanoparticles crossed the blood-brain barrier. The presence of a fluorescent label on the dendrimer had no effect on anti-tumor activity. Future research will focus on determining the maximum therapeutic dose of the targeted nanotherapy and the completion of other studies in preparation for the first human clinical trial, which may begin within two years. The article, "Novel lipoplex nanoparticle to be used in 1st human trial treating advanced solid cancer," discusses an upcoming clinical trial to be conducted at the Lombardi Comprehensive Cancer Center by Dr. John Marshall that employs nanotechnology. It is based on work done at the Department of Oncology, Georgetown University Medical Center by Dr. Esther Chang and her colleagues over a ten year period. Some of this work is reported in [Xu 2002 and Xu 2003]. The researchers developed a tumor targeting drug delivery system that uses liposomes and not viral vectors to deliver the p53 gene to cancerous cells, both primary and metastatic, where ever they occur in the body. A viral vector is a virus that carries a foreign or modified gene. They are used in gene therapy to deliver a desired gene to a cell, e.g., viral vectors can be used to carry genes to targeted cancerous cells that can limit their ability to multiply and spread through the body. Viral vectors can stimulate an anti-tumor immune response in the body. There is, however, the risk of inadvertent transmission of disease by viral vectors. This has led researchers to search for alternative methods for gene delivery. A liposome is a fluid-filled pouch whose wall consists of layers of the material identical to that which makes up a cell membrane (i.e., phospholipids). They are often used to deliver vaccines, enzymes, or drugs in the body. They help to shield healthy cells from a drug's toxicity and prevent a drug's concentration in vulnerable tissues (e.g., the kidneys). This can reduce the typical side effects of nausea, fatigue, and hair loss that often accompany anti-cancer drugs. They are used in treating diseases that affect the immune system because they tend to accumulate in the phagocytes, which recognize them as foreign invaders. Experiments, such as the one reported here, are being conducted to use liposomes to deliver normal, healthy genes to a cell in order to replace a deleted or mutated normal copy of the gene. The researchers coat the surface of each liposome with antibody molecules that bind to the receptor for transferrin (Tf), which is present in high numbers (overexpressed) on cancer cells. The highly compact nanoparticle, which has a relatively uniform size of 100-300 nm in diameter, is called a "TfRscFv-lipoplex" and targets cancerous cells wherever they may be in the body. Once inside a cancerous cell, it delivers the tumor suppressor p53 gene. More than half of all cancer patients have cancer cells that have lost normal functioning of the p53 gene. The research team believes that restoring the p53 gene will improve the tumor-killing ability of traditional treatments. They refer to a TfRscFv-lipoplex nanoparticle that contains a p53 gene as an "immunolipoplex." The researchers believe that the immunolipoplex nanoparticle represents an advance over viral vectors to deliver gene therapy by pointing out that their nanoparticle is targeted specifically to tumors and since it is delivered through the blood stream it can reach metastatic disease. Also, it does not produce the kinds of immunologic response characteristic of viral vectors. The p53 gene is a tumor suppressor gene which means that it stops the formation of tumors. When it binds to DNA it stimulates production of the p21 protein. cdk2 is a protein that stimulates cell division. When p21 binds to cdk2, the cell cannot continue through the cell cycle and does not divide. If the p53 gene is absent or mutated, the p21 protein is not produced, there is no signal to stop cell division, and the cells can divide uncontrollably, forming tumors. Since p53 also plays a critical role in programmed cell death, a signal that tells cells to die if they are damaged. If p53 is not functional in therapies relying on a functional p53 gene, these therapies are less effective. p53 gene mutations are among the most commonly diagnosed genetic disorders and occur in as many as 50 percent of cancer patients. For breast, lung, and colon cancer, p53 gene mutations are the predominant genetic alternations found to date. Although millions of immunolipoplex nanoparticles can be injected into the blood stream at one time, they won't kill cancerous cells on their own. However, they make traditional chemotherapy and radiation more effective. Using different animal models of human cancer, Dr. Chang and her colleagues have demonstrated that the targeted immunolipoplex nanoparticles are able to deliver functioning tumor suppressor genes to human cancer cells, both in primary and metastatic tumors. The researchers tested the nanoparticles in combination with radiation therapy and eliminated prostate and head and neck tumors in mice. The mice then survived cancer-free for more than 200 days, i.e., until they eventually all died of old age rather than cancer. Similar promising results were seen when the nanoparticles were combined with chemotherapy to treat animal models of melanoma and aggressive breast cancer. Head and neck, prostate, pancreatic, breast, bladder, colon, cervical, brain, melanoma, liver and lung cancers are among the solid tumors approved for testing in the clinical trial. There are a number of issues involved in the management of desmoid tumors, and the complexities of recognition and management have led to a designated session devoted to fibromatosis at the next CTOS meeting in London (November, 2008). In addition to fibromatosis there are 3 other designated sessions; Neurofibromatosis Type 1: MPNST and other sarcomas; Gynecological sarcomas; and finally, Sarcomas: impact of age. The goal of these sessions, as it arose from discussions of the CTOS Board of Directors led by Ian Judson, is to highlight the multidisciplinary nature of sarcoma care. In addition to the usual sarcoma team, desmoid tumor care optimally involves gastroenterologists and geneticists. Desmoid tumors may be the first manifestation of FAP in some patients and families. Furthermore, some families with APC mutations exhibit desmoids as their only disease manifestation. A distinctive histopathology has been demonstrated in desmoid tumors of young FAP patients, whose first manifestation of the condition was often this lesion. Desmoids in FAP are monoclonal growths of hyperproliferative fibroblastic cells. Excess cell growth appears to occur on the basis of APC gene inactivation and accumulation of ß-catenin in the cells. The relationship of desmoids in FAP to sporadic cases is uncertain in view of the distinctive early histopathology and the observation that APC gene mutations are uncommon in sporadic desmoids. The relative risk for desmoids in FAP patients compared with the general population is 825. The peak incidence of desmoids in FAP is between 28 and 31 years, although they may occur at any age. Independent predictors for desmoids in FAP include an APC mutation 3' of codon 1444, family history of desmoids, female gender, and the presence of osteomas. Desmoids most commonly occur following surgery after an average of 4.6 years. These growths are one of the most common causes of mortality in FAP patients who have had prophylactic colectomy, with a 10% to 50% mortality rate from the tumor in those with desmoids. The 10-year survival rate is 63%. CT and magnetic resonance imaging are equally effective in following desmoid tumors. Treatment is undertaken for symptoms, cosmetic issues, functional disruption or imminent risk to adjacent structures. Extra-abdominal and abdominal wall desmoids are best treated by surgery with adequate resection of margins. Fewer than half of tumors so treated recur, and further therapy with radiation and repeat excision is usually successful. Surgery is difficult, and sometimes impossible, in cases of intra-abdominal desmoids but remains as an important option in selected cases. Because intra-abdominal desmoids often involve the mesentery or encase vessels or organs, medical therapies are often first attempted. The most consistent initial therapies for abdominal desmoids appear to be the NSAID sulindac and the antiestrogen tamoxifen. Both give a better than 50% response after 3 to 6 months of therapy for FAP. The response may be even better with combination of the two. Combination chemotherapy is effective and can be offered for unresectable cases that fail to respond to this therapy. A combination of low-dose methotrexate and vinblastine demonstrated stabilization of tumor growth or shrinkage in 60% of patients with sporadic desmoids at various stages. Tyrosine kinase inhibition has also shown response. Radiation therapy has also shown success in a number of patients, even those with intra-abdominal tumors. A multi-disciplinary approach is highly recommended for difficult desmoids, especially those that are intra-abdominal. The diagnosis of desmoid tumor, or aggressive fibromatosis, should alert members of the sarcoma team to the potential underlying diagnosis of FAP. This recognition is imperative to the recruitment of gastroenterologists and geneticists who can provide a more focused approach to polyposis screening and genetic testing, which could benefit the extended family as well as the patient. Richard Feynman, who won the Nobel Prize in Physics in 1965 with Julian Schwinger and Sin-Itiro Tomonaga, is often credited with giving birth to the field of nanotechnology in a talk he gave at the annual meeting of the American Physical Society in December 1959, "There's Plenty of Room at the Bottom." Feynman didn't use the term "nanotechnology" in his lecture, but he discussed many extremely interesting problems in designing and building devices at the atomic and subatomic level. When we get to the very, very small world—say circuits of seven atoms—we have a lot of new things that would happen that represent completely new opportunities for design. Atoms on a small scale behave like nothing on a large scale, for they satisfy the laws of quantum mechanics. So, as we go down and fiddle around with the atoms down there, we are working with different laws, and we can expect to do different things. We can manufacture in different ways. We can use, not just circuits, but some system involving the quantized energy levels, or the interactions of quantized spins, etc. Another thing we will notice is that, if we go down far enough, all of our devices can be mass produced so that they are absolutely perfect copies of one another. We cannot build two large machines so that the dimensions are exactly the same. But if your machine is only 100 atoms high, you only have to get it correct to one-half of one percent to make sure the other machine is exactly the same size---namely, 100 atoms high! But it is interesting that it would be, in principle, possible (I think) for a physicist to synthesize any chemical substance that the chemist writes down. Give the orders and the physicist synthesizes it. How? Put the atoms down where the chemist says, and so you make the substance. The problems of chemistry and biology can be greatly helped if our ability to see what we are doing, and to do things on an atomic level, is ultimately developed---a development which I think cannot be avoided. In fact, some of the research summarized in the previous section of this article can be viewed as part of Feynman's (and Hibbs') vision almost 50 years ago; for example, he posits: "A friend of mine (Albert R. Hibbs) suggests a very interesting possibility for relatively small machines. He says that, although it is a very wild idea, it would be interesting in surgery if you could swallow the surgeon. You put the mechanical surgeon inside the blood vessel and it goes into the heart and `looks' around. (Of course the information has to be fed out.) It finds out which valve is the faulty one and takes a little knife and slices it out. Other small machines might be permanently incorporated in the body to assist some inadequately-functioning organ." It was another 15 years after Feynman's insightful talk, however, before the word "nanotechnology" was introduced into the literature. It is generally agreed that Norio Taniguchi introduced the term to refer to "production technology to get the extra high accuracy and ultra fine dimensions, i.e. the preciseness and fineness on the order of 1 nm (nanometer), 10-9 meter in length" [Taniguchi 1974]. Then eight years later, K. Eric Drexler published his now famous paper, "Molecular engineering: An approach to the development of general capabilities for molecular manipulation" [Drexler 1981] which set the stage for a wide variety of nanotechnology activities. In it he discusses the ability to design protein molecules and the fabrication of devices to complex atomic specifications. He describes the construction of molecular machinery able to do a wide variety of functions, including the ability to manipulate biological materials. In 1986 he wrote what is now a well known book, "Engines of Creation: The Coming Era of Nanotechnology", which introduced nanotechnology to a general audience. This article focuses on cancer-related nanotechnology applications, but there are many more nanotechnology investigations underway that may be used in medical contexts other than or in additional to cancer; e.g., nanopore sensors for control of the translocation of DNA (NASA), nanopore sensors to detect chemical and electrical stimuli (Berkeley and Princeton), and magnetic nanoparticles for use in several biomedical applications including NMR imaging (Instituto de Ciencia de Materiales de Madrid, Spain). This article would be incomplete and unreasonable without mention of some of the applications of nanotechnology that are already part of our everyday life. For the past decade, nanotechnology has been a key to developing super-strong materials, such as carbon tubes, that are expected to lead to high-performance clothing, microchips and satellites. However, they are also found in novel foods, chemical coatings, sensors for security systems, water purification units, and high-resolution cinema screens, new and improved properties for use in solar panels, anti-corrosion coatings, tougher and harder cutting tools, photocatalytic air purifiers, chemical catalysts, new materials for optical, electronic and energy storage applications and products. Many nations have established national initiatives in nanotechnology to aggressively exploit this technology in a wide-variety of contexts, including the medical field. The USA's National Cancer Institute's Alliance for Nanotechnology in Cancer is representative of such initiatives focused on attempting to cure cancer, and is discussed below. Standardize the preclinical testing and characterization of nanoscale devices to speed the regulatory review of novel diagnostics, therapeutics, and prevention strategies that use nanoscale devices. Perform preclinical toxicology, pharmacology, and efficacy testing of nanoscale devices created both by NCI intramural and extramural efforts as well as by the private sector. Facilitate collaborations between the NCI, academia, and the private sector to accelerate the translation of basic nanotechnology research into clinical advances. Serve as a nexus for multidisciplinary research, development, and clinical applications of nanotechnology; provide resources, knowledge, tools, and methods for intramural and extramural cancer researchers. Collaborate with other government agencies to leverage resources and expertise in pursuit of common goals in the acceleration of the use of nanotechnology for critical national applications, and team with industry to bring those applications to market. NCI made a significant commitment to nanotechnology research for cancer and set aside a total of $144.3 million for the formation of five CCNE's nationwide. A steering committee will coordinate efforts across all the CCNEs, to facilitate data and technology transfer across centers, interconnecting and leveraging the strengths and advances of each. We've been here before. A new technology is heralded as the 'next big thing.' Companies are created. R&D budgets expand, and investors' eyes gleam at the prospect of new markets. Then two or 10 or 20 years later, when the technology is in widespread use, other effects become evident. For example, before 1929, the toxic gases ammonia, methyl chloride, and sulfur dioxide were used as refrigerants, but fatal accidents occurred because of leakage. In 1928, a new family of non-toxic chemicals, chlorofluorocarbons, was invented and became the standard for refrigerants. Only decades later did we recognize that the release of CFCs was dissolving the earth's ozone layer. Unfortunately there are many similar examples, including DDT and leaded gasoline, where we later learned of various unintended consequences of initially promising technologies. An early and open examination of the potential risks of a new product or technology is not just good common sense -- it's good business strategy. We need to make sure this assessment takes place now for today's "next big thing" -- nanotechnology. With the right mix of voluntary corporate leadership, coordinated research, and informed regulation, we can reap the benefits of this promising technology while reducing the likelihood of unintended consequences. Given potential liability and market risks, industry, universities, government and public interest groups should collaborate to determine what testing is necessary for new nanoproducts. Businesses should conduct the needed testing before new products enter commercial use. Products that use nanomaterials are already in our stores. Good product stewardship requires a commitment to identifying and managing any potential risks. A collaborative effort could set interim standards for nanotechnology around the world while regulations are under development. Nanomaterials themselves may also have unintended environmental consequences. As a chemist I know all too well how unforeseen health effects can destroy industries based on complex materials. From asbestos to DDT we have, as a society, paid an enormous price for not evaluating toxicological and ecosystem impacts before industries develop. The real losers here are not environmentalists; instead they are the businesses who enthusiastically embrace new materials, only to face a decade later debilitating liability claims from employees, consumers and governments. And in the case of nanotechnology, the ultimate losers may be the American taxpayers who invested over one billion dollars in nanomaterials research without any hard data on their toxicological and environmental effects. This might seem like a distant issue with no effects on you or your constituents. However, if you have used a sunscreen in the last year it is possible that your skin came in contact with nanoscale ceramics. Is this a cause for concern? No one knows. It is remarkable that I must answer this way for a field with the funding levels and cachet of nanotechnology. Still, there are some general principles which help us think through the issue. Nanomaterials are valuable in many technologies because they interact quite differently with the body than larger materials. For example, you can wear a silver bracelet with no ill effects but if you eat too much nanoscale silver, as some people have in the belief it has various health benefits, you will turn yourself blue. Finely divided solids have access to areas of the body and interact with biological systems in completely unexpected ways, which is exactly why they are so powerful in medical applications. The converse of this is that unintended exposures-of research workers, factory workers, and the general public-to nanoscale solids could have more dire consequences than turning skin blue. Or they could turn out to be benign. We just don't know. If we fail to answer these questions early, public acceptance of nanotechnologies could be in jeopardy, and the entire industry derailed. It's not as if no one has ever thought about how particulate matter generally can interact with organisms. We can learn a lot from particle toxicologists who characterize the effects of aerosolized particles of all sizes on health, as well as from bioengineers who consider the effects of larger particulates generated by implants wearing down in the body. Still, specific information on the health impacts of very small, nanoengineered particles under 20 nanometers is hard to come by. So the one thing everybody agrees on is that there just is not a lot of information out there. Getting that information isn't going to be a simple task. Nanomaterials are incredibly diverse. You can have nanoscale carbon, nanoscale Teflon, nanoscale you name it. Within that huge diversity of materials, it would be almost amazing if all those materials were as safe as water. The toxicology data is going to start to come out, and it is almost certain that it's not going to be: nanomaterials are totally safe. Nothing in the world is totally safe. Nanotechnology promises potentially great benefits. We need to understand the risks inherent in exploiting this technology in the myriad of contexts that it currently is, and will be deployed, and weigh these risks against the benefits. I strongly recommend that we as a scientific and engineering community do this within an international setting, cooperating with fellow scientists and engineers and governments throughout the world to establish relevant international standards and laws. What we should not do, however, is let our fear of unknown risk constrain the vision and extent of our research. We should proceed aggressively with nanotechnology research in the medical arena. This section presents strong rhetoric against taking risks and summarizes a position advocating research even in the face of the unknown. I hope you do not conclude that my statement advocating nanotechnology research is weak or unfounded, but rather that I believe it is obvious that we should proceed with such research even in light of the "risk" arguments. We must explore this technology in order to understand it's true potential and its true risks. A number of very interesting questions arise when using nanotechnology for diagnostic purposes. For example, what it will mean to find "ultra-tiny" tumors long before they become clinically detectable? Will tumors be found that will never become clinically significant? When is a diagnostic test too sensitive? Nanotechnology diagnostic devices will have to contend with the ongoing questions that diagnostic screening must address, e.g., are the economic, emotional, and psychologica costs of the screening justified in light of survival benefit studies? Clearly, we need to learn more about how to use this technology to determine if it will truly be an advance over currently available screening tools. From my perspective the only way we can learn the answers to such questions is by undertaking the required research. Over the past decade, scientists have made remarkable discoveries of the molecular mechanisms that cause sarcomas and other cancers and are just now seeing the payoff in the form of treatments that specifically target genes or proteins of those cancer cells. However, investigators have much more to learn about the translocation-specific sarcomas, not to mention the large majority of cancers that do not carry a known genetic abnormality. It is our hope that the knowledge obtained from the study of the better-understood sarcomas will apply to their uncharacterized relatives and to solid tumors as a whole, as demonstrated by recent advances in therapies for lung cancer. We believe strongly that the systematic analysis of these remarkable tumors will result in an enormous benefit to patients within the next few years. Paraphrasing the statement used in 1955 to announce the Salk vaccine to the world, what we would soon like to hear is, "The nanodevice works. It is safe, effective and potent." Center for Responsible Nanotechnology: From CRN's website, "The Center for Responsible Nanotechnology is a non-profit think tank concerned with the major societal and environmental implications of advanced nanotechnology. CRN promotes public awareness and education, and the crafting and implementation of effective policy to maximize benefits and reduce dangers. We engage individuals and groups to better understand the implications of molecular manufacturing and to focus on the real risks and benefits of the technology. Our goal is the creation and implementation of wise, comprehensive, and balanced plans for global management of this transformative technology." "Impact of Nanotechnology on Biomedical Sciences: Review of Current Concepts on Convergence of Nanotechnology with Biology," by Herbert Ernest and Rahul Shetty. AZONano's Online Journal of Nanotechnology, May 2005. Institute for Molecular Manufacturing: From the IMM website, "The Institute for Molecular Manufacturing (IMM) is a nonprofit foundation formed in 1991 to conduct and support research on molecular systems engineering and molecular manufacturing (molecular nanotechnology, or MNT). IMM also promotes guidelines for research and development practices that will minimize risk from accidental misuse or from abuse of molecular nanotechnology." You can view a video called a "Journey into Nanotechnology" on the National Cancer Institute's Alliance for Nanotechnology in Cancer website. Nanotech Poised To Fire Up Medicine's Next Revolution! From Polio to Cancer — Diagnosis and Delivery Tools Are Key, Nano Science and Technology Institute, May 2005. National Institutes of Health Bioengineering Consortium: From the BECON website, "Bioengineering integrates physical, chemical, mathematical, and computational sciences and engineering principles to study biology, medicine, behavior, and health. It advances fundamental concepts; creates knowledge from the molecular to the organ systems levels; and develops innovative biologics, materials, processes, implants, devices, and informatics approaches for the prevention, diagnosis, and treatment of disease, for patient rehabilitation, and for improving health." National Nanotechnology Initiative: NNI is a US Governmental R&D program established to coordinate the multi-agency efforts in nanoscale science, engineering, and technology. Their "Resources" page is worth exploring. National Science Foundation's Nanotechnology Screen Saver website. [Benenson 2004] Yaakov Benenson, Binyamin Gil, Uri Ben-Dor, Rivka Adar and Ehud Shapiro, Nature, "An autonomous molecular computer for logical control of gene expression", Nature, published online, doi:10.1038/nature02551, 2004. [Colvin 2003] Testimony of Dr. Vicki L. Colvin, Director, Center for Biological and Environmental Nanotechnology (CBEN) and Associate Professor of Chemistry, Rice University, Houston, Texas before the U.S. House of Representatives Committee on Science in regard to "Nanotechnology Research and Development Act of 2003" April 9, 2003. [Drexler 1981] K. Eric Drexler, "Molecular engineering: An approach to the development of general capabilities for molecular manipulation", Proceedings of the National Academy of Sciences, Vol. 78, No. 9, September 1981, pp. 5275-5278. [Drexler 1986] Eric K. Drexler, "Engines of Creation: The Coming Era of Nanotechnology", Anchor Books, 1986, ISBN 0-385-19973-2. The link is to the web version of the book, which introduces nanotechnology to a general audience. [Hu1 2005] Siwen Hu, Jeremy D. Heidel, Derek W. Barlett, Donald B. Kohn, Mark E. Davis, Timothy J. Triche, "Systemic targeted EWS-FLI1 siRNA abrogates growth of metastases in a murine Ewing's tumor model", Abstract 6104, 96th Annual Meeting, American Association for Cancer Research, April 16-20, 2005. [Hu-Lieskovan 2005] Siwen Hu-Lieskovan, Jeremy D. Heidel, Derek W. Barlett, Mark E. Davis, and Timothy J. Triche, "Sequence-specific knockdown of EWS-FLI1 by targeted, non-viral delivery of siRNA inhibits tumor growth in a murine model of metastatic Ewing's sarcoma", to appear in Cancer Research, Oct. 1, 2005. [Kam 2005] Nadine Wong Shi Kam, Michael O'Connell, Jeffrey A. Wisdom, and Hongjie Dai, "Carbon nanotubes as multifunctional biological transporters and near-infrared agents for selective cancer cell destruction", Proceedings National Academy of Sciences, August 16, 2005, V. 102, N. 33, pp. 11600–11605. [Kukowska-Latallo 2005] Jolanta F. Kukowska-Latallo, Kimberly A. Candido, Zhengyi Cao, Shraddha S. Nigavekar, Istvan J. Majoros, Thommey P. Thomas, Lajos P. Balogh, Mohamed K. Khan and James R. Baker, Jr., "Nanoparticle Targeting of Anticancer Drug Improves Therapeutic Response in Animal Model of Human Epithelial Cancer", Cancer Research V. 65, June 15, 2005, pp, 5317-5324. [Nayak 2004] Satish Nayak; Hsienming Lee, Jean Chmielewski, and L. Andrew Lyon, "Folate-Mediated Cell Targeting and Cytotoxicity Using Thermoresponsive Microgels", Journal of the American Chemical Society, 2004, V. 126, pp. 10258-10259. [Rotman 2003] David Rotman, "Measuring the Risks of Nanotechnology" MIT's TechnologyReview.com, April 2003. This is an interview with Dr. Vicki L. Colvin exploring the safety of nanotechnology. [Sengupta 2005] "Temporal targeting of tumour cells and neovasculature with a nanoscale delivery system", Shiladitya Sengupta, David Eavarone, Ishan Capila, Ganlin Zhao, Nicki Watson, Tanyel Kiziltepe, Ram Sasisekharan, Nature. V. 436, 28 Jul 2005, Letters to Editor, pp. 568-572. [Taniguchi 1974] NorioTaniguchi, "On the Basic Concept of 'NanoTechnology", Proceedings of the International Conference on Production Engineering. Tokyo, Part II, Japan Society of Precision Engineering, 1974. [XU 2003] Liang Xu, Peter Frederik, Kathleen F. Pirollo, Wen-Hua Tang, Antonina Rait, Lai-Man Xiang, Weiqun Huang, Idalla Cruz, Yuzhi Yin, and Esther H. Chang, "Self-Assembly of a Virus-Mimicking Nanostructure System for Efficient Tumor-Targeted Gene Delivery", Human Gene Therapy, February 2003, V. 13, pp. 469-481. This image is a work of the National Institutes of Health, part of the United States Department of Health and Human Services. As a work of the U.S. federal government, the image is in the public domain. The photo is attributed to Drs. Noguchi, Rodgers, and Schechter of NIDDK. Figure Courtesy of Calando Pharmaceuticals: Calando and its collaborators have generated preclinical data that demonstrate sequence-specific gene inhibition in tumors from the systemic administration of targeted formulations of siRNA. 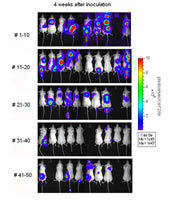 Workers at Caltech and Children's Hospital-LA created a mouse model of Ewing's sarcoma using luciferase-expressing, human Ewing's sarcoma cells that allows for real time bioluminescence monitoring. "Mice 1-10 received sham injections, [mice] 11-20 [received] naked anti-EWS-FLI1 siRNA, [mice] 21-30 [received] fully formulated siRNA with an unrelated sequence to EWS-FLI1, [mice] 31-40 [received] fully formulated anti-EWS-FLI1 siRNA and [mice] 41-50 [received] anti-EWS-FLI1 siRNA formulated with the delivery system that did not contain the targeting ligand. All injections were at 2.5mg/kg via the tail vein. 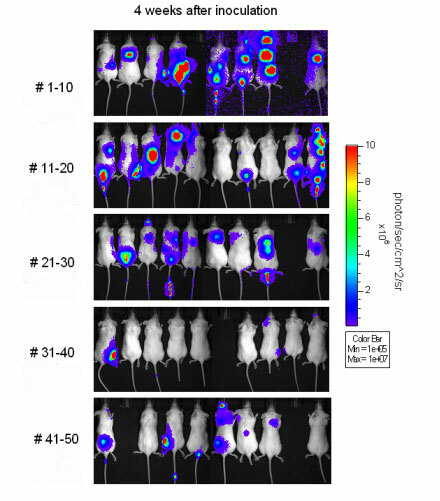 The data in the figure show that only the targeted formulation [i.e., mice 31-40] provides any anti-tumor efficacy—control sequences and removal of the targeting ligand eliminates the anti-tumor effects. Additionally, no abnormalities in IL-12 and interferon-alpha, liver and kidney function tests, complete blood counts or pathology of major organs was observed. Of major significance is that the delivery system does not produce an interferon response like those obtained from lipid delivery of siRNA even when published immunostimulatory motifs are included in the siRNA." a) Each computer consists of three, semi-independent modules. To a certain extent, changes may be made in one of the modules without affecting the other two. b) The input module checks for the presence or absence of up to eight indicators for disease - (upper left letters) The computation module processes this data and performs diagnosis by giving the "certainty level" for the presence of the disease. The output module can now act accordingly by releasing a drug (letters in gray) to fit the diagnosis. c) A graphic scheme of the computer (automaton) design. If a cancer marker is detected, the automaton will stay in the initial "Yes" state. If, however, one marker is absent, the automaton will move to the "No" state, with no possible return to the "Yes" state. The computer then "examines" the final state, making its diagnosis, and releases a drug or drug suppressor accordingly. d) A tree-diagram of a computation process. Diagnosis proceeds one marker at a time. Failure to detect a marker at any point will switch the system from "Yes" to "No," and the computation module remains in this state, irrespective of the detection of further markers. This molecular diagram shows a dendrimer nanoparticle to which they attached folic acid to target nanoparticles to cancer cells, methotrexate as the anticancer drug, and fluorescent molecules to act as an optical imaging agent. Figure courtesy of the University of Michigan.